We’ve just returned from our vacation in the Adirondacks. Part of the offerings where we were staying was a series of seminar talks by a well-known Christian celebrity with a very successful women’s ministry. What was so startling in the talks was her use of the Scriptures. Being in my little embattled corner as a Reformed Anglican I am not in the evangelical world very often, but what I heard that week was the most blatant proof-texting and eisegesis that would make any liberal proud. Indeed, there wasn’t anything in her four talks with which a very far-to-left liberal would disagree. They could have given the exact same talks. With my head still reeling from what I had heard, I asked myself, “To whom is this celebrity accountable for such a travesty of biblical teaching?” The answer: no one, because she is a successful celebrity with 22,000 participants in her online bible study from her parachurch website. She is accountable only to the marketplace where her numbers validate her teaching authority. (4) numerical increase must be everyone’s main goal. I detect four unhappy consequences of this. First, big and growing churches are viewed as far more significant than others. Second, parachurch specialists who pull in large numbers are venerated, while hard-working pastors are treated as near-nonentities. 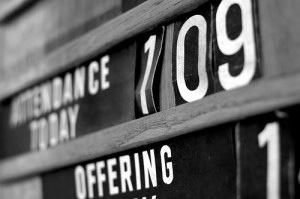 Third, lively laymen and clergy too are constantly being creamed off from the churches to run parachurch ministries, in which, just because they specialize on a relatively narrow front, quicker and more striking results can be expected. Fourth, many ministers of not-so-bouncy temperament and not-so-flashy gifts return to secular employment in disillusionment and bitterness, concluding that the pastoral life of steady service is a game not worth playing. In all of this I seem to see a great deal of unmortified pride, either massaged, indulged, and gratified, or wounded, nursed, and mollycoddled. Where quantifiable success is god, pride always grows strong and spreads through the soul as cancer sometimes gallops through the body. Shrinking spiritual stature and growing moral weakness thence result, and in pastoral leaders, especially those who have become sure they are succeeding, the various forms of abuse and exploitation that follow can be horrific. Orienting all Christian action to visible success as its goal, a move which to many moderns seems supremely sensible and businesslike, is thus more a weakness in the church than its strength; it is a seedbed both of unspiritual vainglory for the self-rated succeeders and of unspiritual despair for the self-rated failures, and a source of shallowness and superficiality all round. The way of health and humility is for us to admit to ourselves that in the final analysis we do not and cannot know the measure of our success the way God sees it. Wisdom says: leave success ratings to God, and live your Christianity as a religion of faithfulness rather than an idolatry of achievement. Packer writes that he would like to see Kent and Barbara Hughes’ book, Liberating Ministry from the Success Syndrome, “…made required reading for every pastoral aspirant.” I would add, “… and for every committed Christian.” The inevitable result of Google trumping the local pastor and the local church is a detachment from the gospel as revealed in the Scriptures that adults may be able to sustain but will sow the unintended consequence of the loss of that scriptural gospel for their children. Many thanks to Justin Taylor for the Packer quotation and photograph.